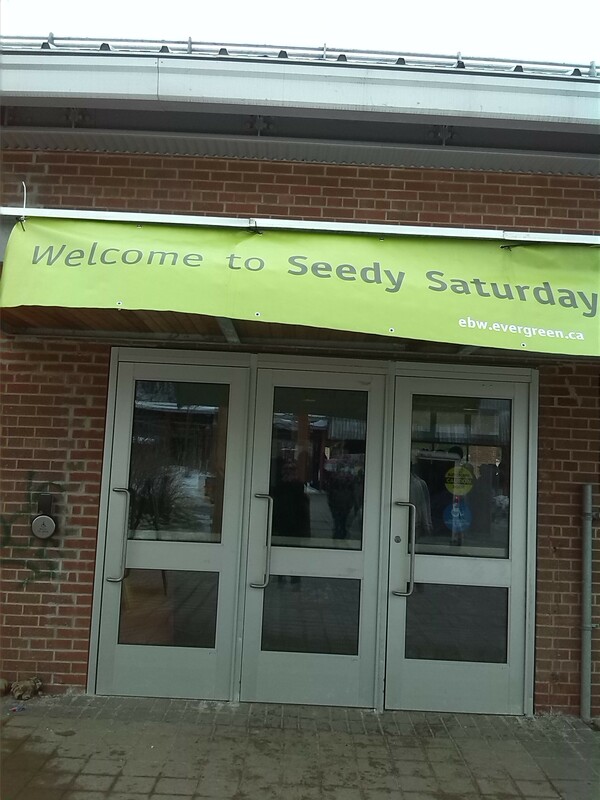 Once again Seedy Saturday found me unprepared. 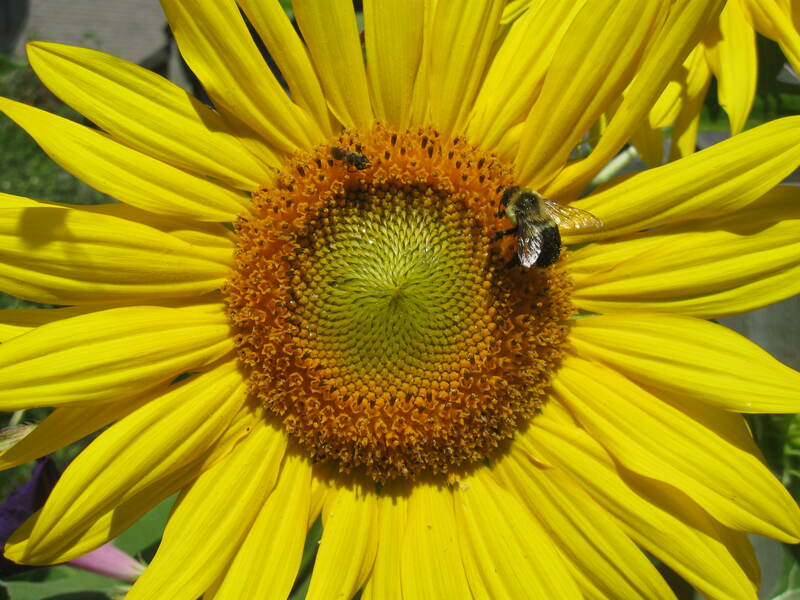 At the beginning of the year I was checking the Toronto Community Gardening Network‘s website religiously for word on dates and then I got busy with other things, as you do. 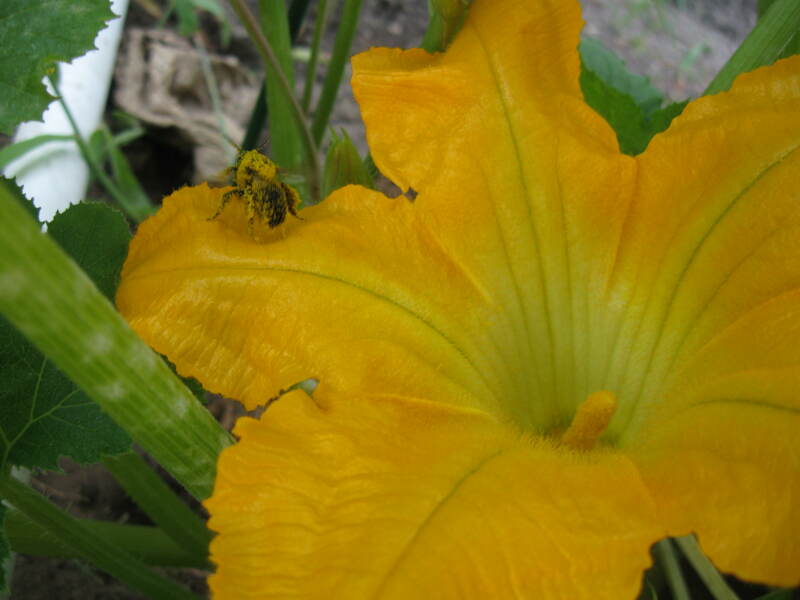 I was hoping that one of the many gardening sites I follow on Facebook would have mentioned something. So I got lax with my garden planning and as a result there is no plan. This week I happened to check the TCGN site and found out the first event of the season was at the Brickworks on Saturday. How convenient! I could go right after my yoga class. After attending the 10am class at The Yoga Sanctuary Danforth, I walked over to Broadview station to take the shuttle. While I was waiting I was mobbed by a flock of pigeons residing in the area. First they flew around me, then a few actually landed on me! I remember cringing with my arms held up, looking at the one on my left arm out of the corner of my eye, noticing how fat and wrinkly his toes were as his claws gripped my coat, feeling a few others on my shoulders and one perched on my hat, thinking about how I could get my phone out of my purse to take a picture of this ‘cuz who would believe me… I was eating a banana at the time so I assumed that they jumped on me to get at it. I tossed the remains on the icy ground but none of them went for it. I’m not sure what caused them to suddenly fly off with their band of brothers, but I was very thankful that I came out of the affair poop-free. This incident began a very interesting conversation with the lovely older gentleman also waiting for the shuttle (we were the only ones there at the time). He commented on how aggressive pigeons in this city had become and that people must be feeding them. I responded that this had never happened to me before and that I would have preferred to have more interesting birds land on me than pigeons. 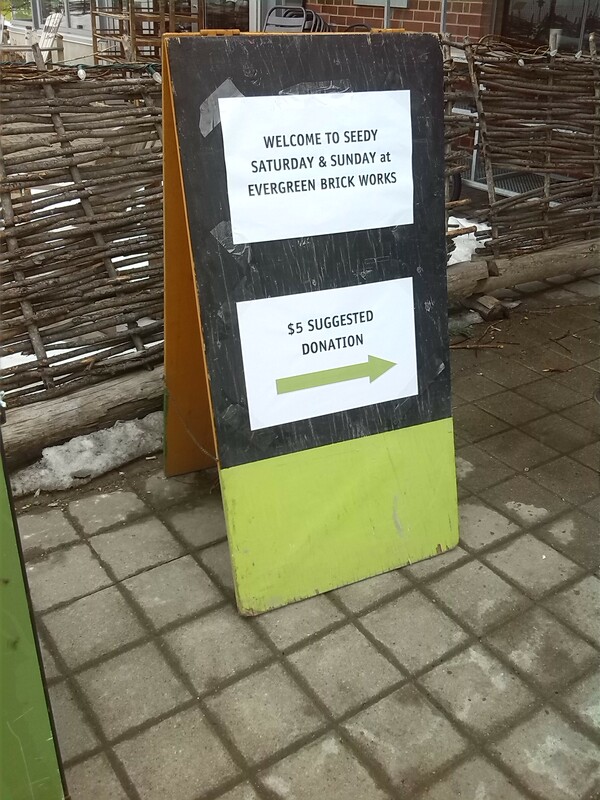 I asked if he was coming to the Brickworks for Seedy Saturday and he said yes. I admitted that I was not prepared to purchase anything today but I planned on browsing. 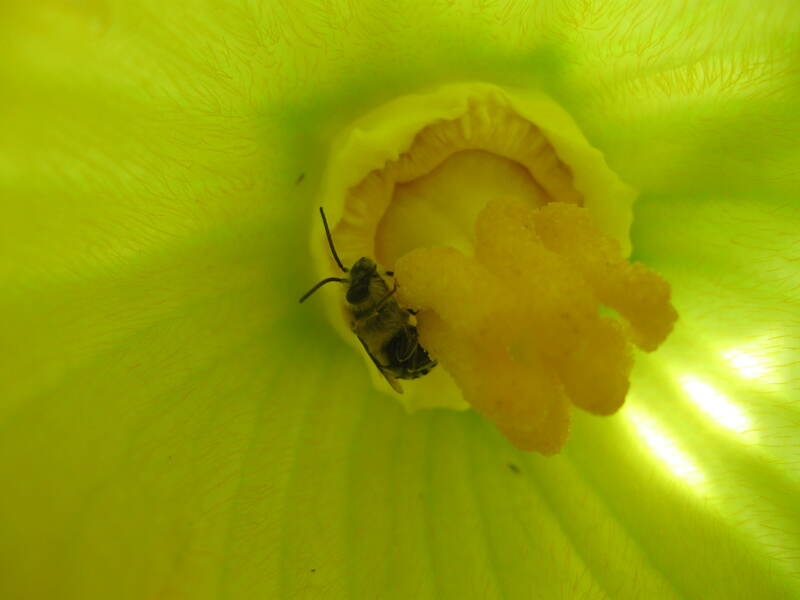 He was coming to help man one of the booths but he also planned to browse the seed selection. He was looking rare things that caught his fancy. As we waited for the shuttle, he told me that he belonged to a beekeeping cooperative which he had been involved in for about 8 years. He really caught my attention with his story about taking a beekeeping course at the Botanical Gardens (gear provided) and said that being with the bees wasn’t scary and in fact for him being in the midst of the bees was like “zen.” He said there are quite a few colonies across the city, including one on the 14th floor of the Fairmount Royal on Front Street. 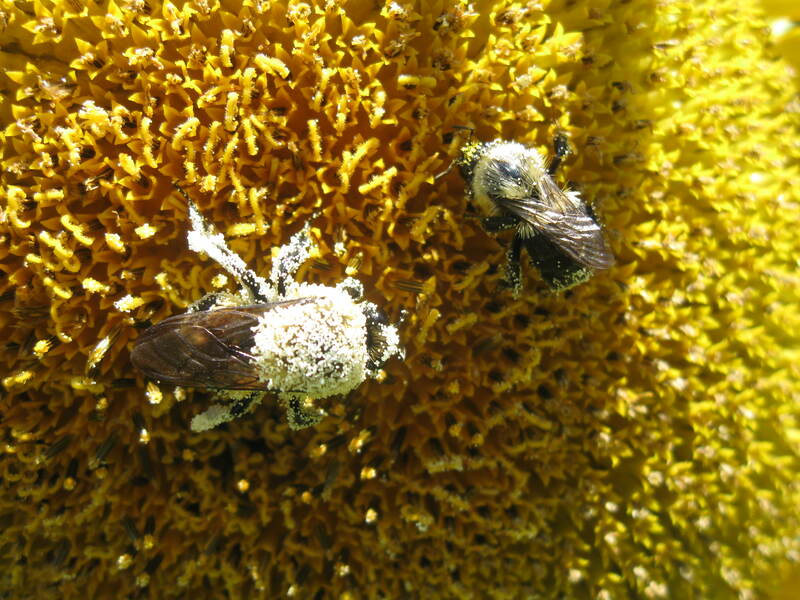 It’s quite a commitment as “you are there for the bees, not when you want to be there.” I wondered what this zen experience would be like and if at the end of the course one got to leave with a jar of honey. He told me, “I think so. I did.”, and we laughed. As we rode the shuttle down to the Brickworks, he told me about his experience growing an exotic tomato from Asia that had thorns and tasted a bit like guava (but the taste varied depending on how ripe it was when you picked it), how it was really great at keeping the “four and two-legged raccoons” out of his allotment plot in High Park. He also regaled his experience of attending the garlic festival at the Brickworks, the only place on earth where it was OK for men and women to have bad breath :). We parted ways inside the Marketplace and I set my sights on finding my favorite seed purveyors: Urban Harvest. 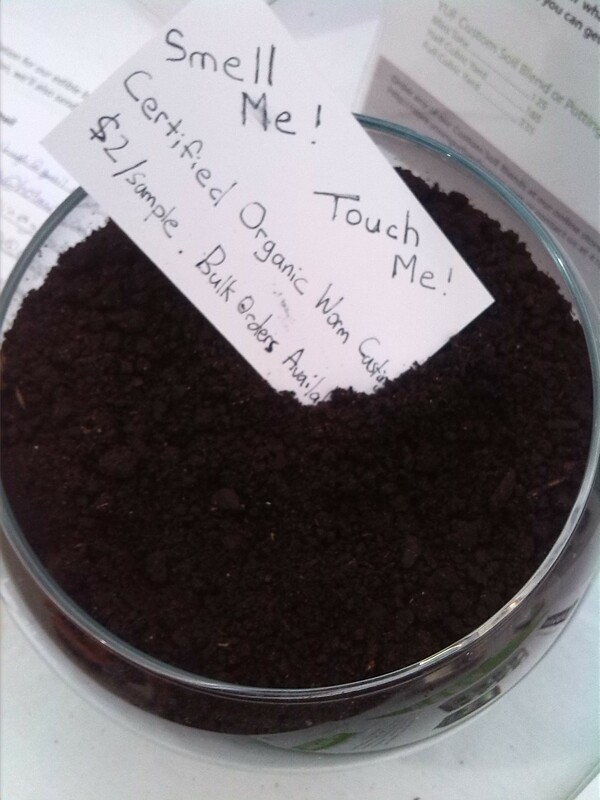 There was a lot going on: seed exchanges, community workshops, and organizations concerned with food issues hoping to engage with and garner support from like-minded people, in addition to what I assumed was the usual Saturday fare at the Brickworks. This sample had no smell and felt very fine and dry. Interesting! I love the retro cover! 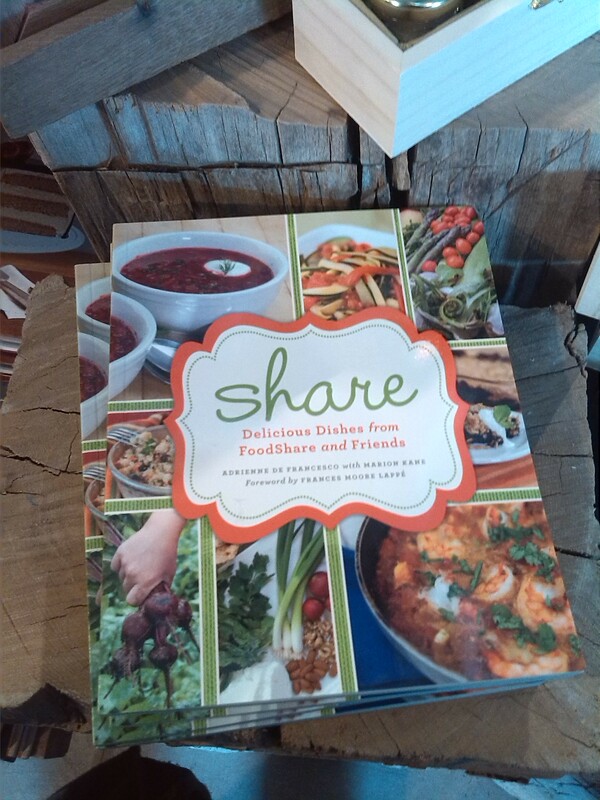 FoodShare‘s cover looks so appetizing! 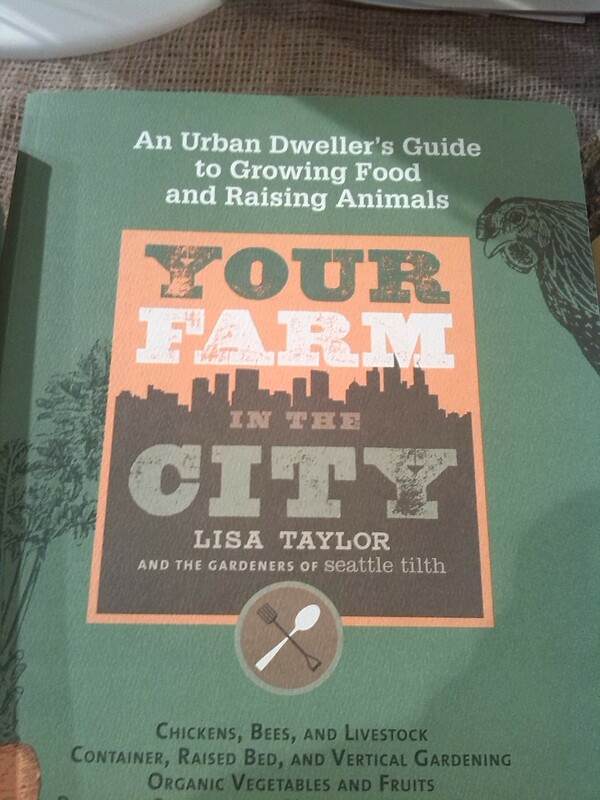 I wonder what it would be like to raise animals, like chickens, in the city? 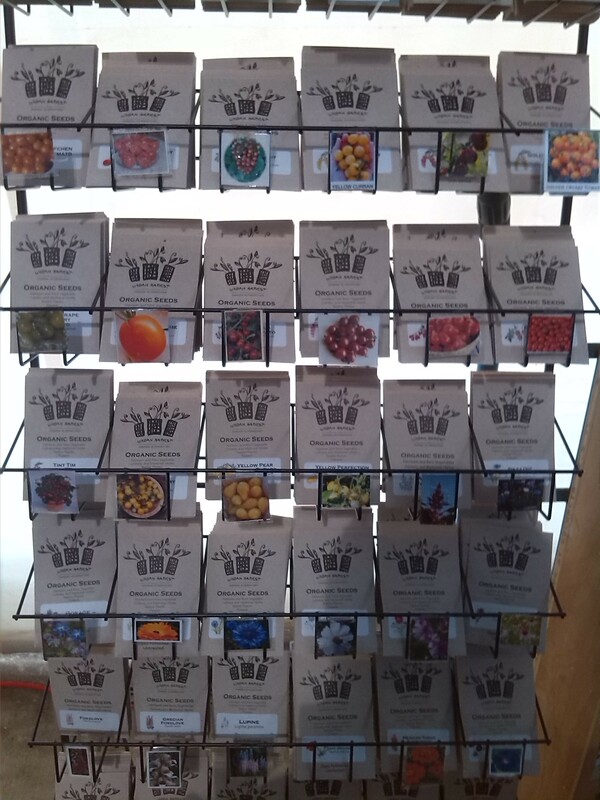 Urban Harvest was crowded and I spent a good 45 minutes picking up and reading the back of seed packets and making a list of what seeds I might want to purchase. 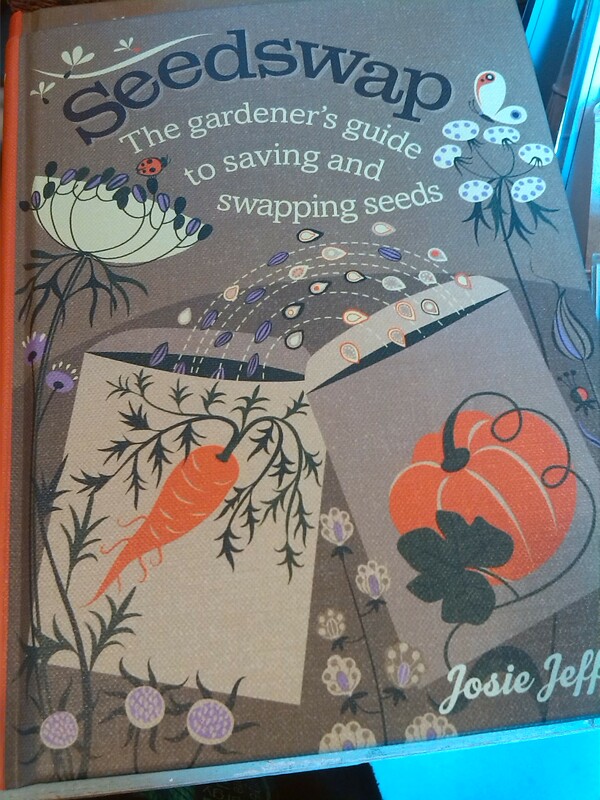 Although I hadn’t checked what seeds I needed before I showed up, in a frenzy of excitement I bought 10 seed packets and some kelp meal. 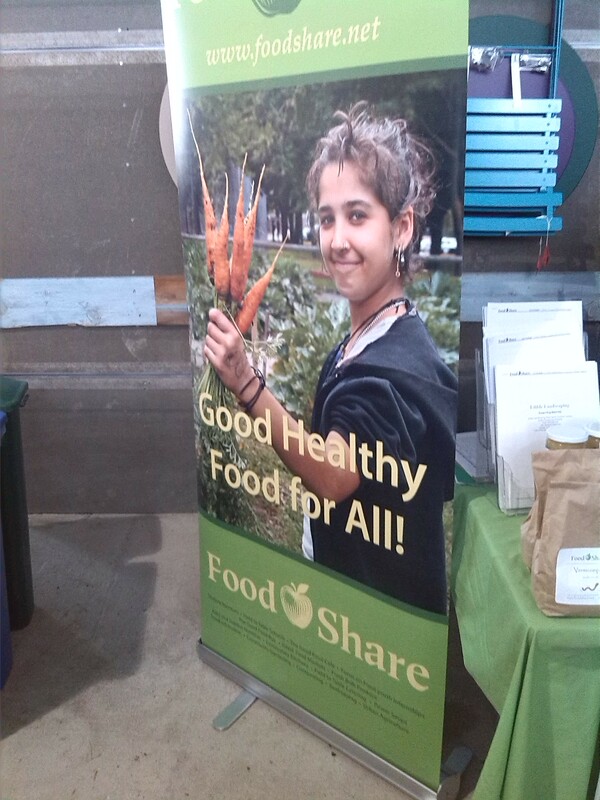 This was the smallest of five racks at Urban Harvest’s table – so much to choose from! I still plan to go to the next event at Scadding Court next Saturday, which I was told by the owner of Urban Harvest, was the original site for the event when it began in Toronto.